Boker's is a stamping manufacturer of metal disks and non-metallic disks. A disk can be a round washer with or without a center hole. Disks are also commonly referred to as discs, circles, plates and/or slugs. Functional uses of disks include providing a precise space between components or materials as well as load disbursement. Disks are used in a variety of industry products including agricultural equipment, automotive, medical devices, consumer appliances, electronics, cutlery as well as decorative uses for jewelry and accessories. Disks are essentially round washers with or without a center hole. Boker's disks are offered with outside diameters ranging from 0.030 inches to 12.000 inches and with material thickness options ranging from .005" to .190". 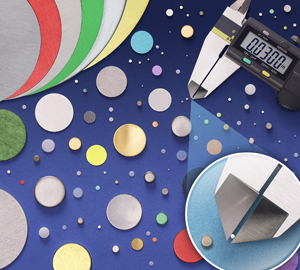 With ready access to more than 2,000 commonly specified and difficult-to-find materials, Boker’s delivers disks in materials including low-carbon sheet steel, various spring steels, stainless steel, aluminum, brass, copper and nickel silver. Non-metallic material options include ABS, acetal, polyester, nylon, nylon MD, polycarbonate, fiber, polyethylene and various NEMA grade laminates. To obtain a quote for a disks please fill out our fast quote form. Choose from a wide variety of sizes and materials with no tooling charges. Search below to identify tools in stock available for manufacturing your disks. You can choose a thickness within the tool range indicated.